The preservation of embryos and juveniles is a rare occurrence in the fossil record. The tiny, delicate skeletons are usually scattered by scavengers or destroyed by weathering before they can be fossilized. Ichthyosaurs had a higher chance of being preserved than did terrestrial creatures because, as marine animals, they tended to live in environments less subject to erosion. Still, their fossilization required a suite of factors: a slow rate of decay of soft tissues, little scavenging by other animals, a lack of swift currents and waves to jumble and carry away small bones, and fairly rapid burial. Given these factors, some areas have become a treasury of well-preserved ichthyosaur fossils. The deposits at Holzmaden, Germany, present an interesting case for analysis. The ichthyosaur remains are found in black, bituminous marine shales deposited about 190 million years ago. Over the years, thousands of specimens of marine reptiles, fish, and invertebrates have been recovered from these rocks. The quality of preservation is outstanding, but what is even more impressive is the number of ichthyosaur fossils containing preserved embryos. Ichthyosaurs with embryos have been reported from 6 different levels of the shale in a small area around Holzmaden, suggesting that a specific site was used by large numbers of ichthyosaurs repeatedly over time. The embryos are quite advanced in their physical development; their paddles, for example, are already well formed. One specimen is even preserved in the birth canal. In addition, the shale contains the remains of many newborns that are between 20 and 30 inches long. Why are there so many pregnant females and young at Holzmaden when they are so rare elsewhere? The quality of preservation is almost unmatched and quarry operations have been carried out carefully with an awareness of the value of the fossils. But these factors do not account for the interesting question of how there came to be such a concentration of pregnant ichthyosaurs in a particular place very close to their time of giving birth. 1. The passage supports which of the following conclusions? (A) Some species of ichthyosaurs decayed more rapidly than other species. (B) Ichthyosaur newborns are smaller than other new born marine reptiles. (C) Ichthyosaurs were more advanced than terrestrial creatures. (D) Ichthyosaurs may have gathered at Holzmaden lo give birth. 4. Which of the following is true of the fossil deposits discussed in the passage ? (A) They include examples of newly discovered species. (B) They contain large numbers of well-preserved specimens. (C) They are older than fossils found in other places. (D) They have been analyzed more carefully than other fossils. 7. Why does the author mention the specimens preserved in the birth canal (line 21-22)? 10. Which of the following best expresses the relationship between the first and second paragraphs? (A) The first paragraph describes a place which the second paragraph describes a field of study. 11. Where in the passage does the author mention the variety of fossils found at Holzmaden? (A) The preservation of embryos and juveniles is a rare occurrence in the fossil record…. The Lewis and Clark expedition, sponsored by President Jefferson, was the most important official examination of the high plains and the Northwest before the War of 1812. The President’s secretary, Captain Meriwether Lewis, had been instructed to “explore the Missouri River, and such principal streams of it as, by its course and communication with the waters of the Pacific Ocean. . . may offer the most direct and practicable water communication across the continent, for the purposes of commerce.” Captain William Clark, the younger brother of famed George Rogers Clark, was invited to share the command of the exploring party. Amid rumors that there were prehistoric mammoths wandering around the unknown region and that somewhere in its wilds was a mountain of rock salt 80 by 45 miles in extent, the two captains set out. The date was May 14,1801. Their point of departure was the mouth of the Wood River, just across the Mississippi from the entrance of the Missouri River. After toiling up the Missouri all summer, the group wintered near the Mandan villages in the center of what is now North Dakota. Resuming their journey in the spring of 1805. The men worked their way along the Missouri to its source and then crossed the mountains of western Montana and Idabo. Picking up a tributary of the Columbia River, they continued westward until they reached the Pacific Ocean, where they stayed until the following spring. Lewis and Clark brought back much new information, including the knowledge that he continent was wider than originally supposed. More specifically, they learned a good deal about river drainages and mountain barriers. They ended speculation that an easy coast-to-coast route existed via the Missouri-Columbia River systems, and their reports of the climate, the animals and birds, the trees and plants, and the Indians of the West – though not immediately published – were made available to scientists. 12. With what topic is the passage primarily concerned? 17. The phrase “Picking up” in paragraph 2 could best be replaced by which of the following? 19. Where in the passage does the author refer to the explorers’ failure to find an easy passageway to the western part of the continent? (C) …crossed the mountains of western Montana and Idabo. Picking up a tributary of the Columbia River, they continued westward until they reached the Pacific Ocean, where they stayed until the following spring…. (D) …good deal about river drainages and mountain barriers. They ended speculation that an easy coast-to-coast route existed via the Missouri-Columbia River systems, and their reports of the climate, the animals and birds, the trees and plants, and the Indians of the West – though not immediately published – were made available to scientists…. For a century and a half the piano has been one of the most popular solo instruments for Western music. Unlike string and wind instruments, the piano is completely self-sufficient, as it is able to play both the melody and its accompanying harmony at the same time. For this reason, it became the favorite household instrument of the nineteenth century. The ancestry of the piano can be traced to the early keyboard instruments of the fifteenth and sixteenth centuries-the spinet, the dulcimer, and the virginal. In the seventeenth century the organ, the clavichord, and the harpsichord became the chief instruments of the keyboard group, a supremacy they maintained until the piano supplanted them at the end of the eighteenth century. The clavichord’s tone was metallic and never powerful, nevertheless, because of the variety of tone possible to it, many composers found the clavichord a sympathetic instrument for intimate chamber music. The harpsichord with its bright, vigorous tone was the favorite instrument for supporting the bass of the small orchestra of the period and for concert use but the character of the tone could not be varied save by mechanical or structural devices . The piano was perfected in the early eighteenth century by a harpsichord maker in Italy (though musicologists point out several previous instances of the instrument). This instrument was called a piano e forte (soft Mid loud), to indicate its dynamic versatility; its strings were struck by a recoiling hammer with a felt-padded head. The wires were much heavier in the earlier instruments. A series of mechanical improvements continuing well into the nineteenth century, including the introduction of pedals to sustain tone or to soften it, the perfection of a metal frame, and steel wire of the finest quality, finally produced an instrument capable of myriad tonal effects from the most delicate harmonies to an almost orchestral fullness of sound, from a liquid, singing tone to sharp, percussive brilliance. 20. What does the passage mainly discuss ? 21. Which of the following instruments was widely used before the seventeenth century? 25. According to the passage, what deficiency did the harpsichord have? (B) It lacked variety in tone. (D) It could not produce a strong sound. 26. Where in the passage does the author provide a translation? (A) …same time. For this reason, it became the favorite household instrument of the nineteenth century…. (B) …music. The harpsichord with its bright, vigorous tone was the favorite instrument for supporting the bass of the small orchestra of the period and for concert use but the character of the tone could not be varied save by mechanical or structural devices …. (D) …wires were much heavier in the earlier instruments. A series of mechanical improvements continuing well into the nineteenth century, including the introduction of pedals to sustain tone or to soften it, the perfection of a metal frame, and steel wire of the finest quality, finally produced an instrument capable of myriad tonal effects from the most delicate harmonies to an almost orchestral fullness of sound, from a liquid, singing tone to sharp, percussive brilliance…. 27. According to the information in the third paragraph , which of the following improvements made it possible to lengthen the tone produced by the piano? Hi Saurabh, I will update Solution & Explanation for TOEFL Reading Practice Test Daily from test 01 to test 75. 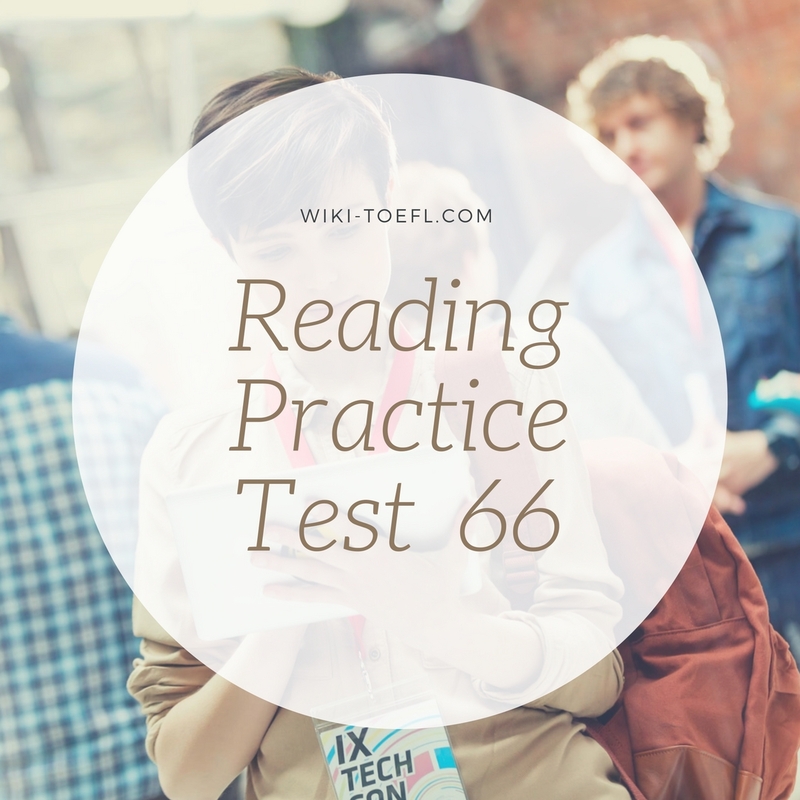 Now is Reading Practice Test 2, you can find here: https://wiki-study.com/toefl-ibt-reading-practice-test-02-solution/. Please wait and follow my blog to receive the Latest Reading Solution. Please send me the answer key of test66.